Why Identity, Governance and Administration? Obtaining visibility and control of access-rights in large enterprise IT environments with a multitude of systems and applications is no simple endeavour. Research indicates that up to 70% of users have access to systems or confidential business data outside of their current responsibility. Employees are considered the most likely source of corporate security breaches – whether these happen unintentionally or deliberately. To gain efficiency and control security concerns, an identity and access management strategy is a prerequisite. It will secure businesses against security breaches and leaks of business-critical data. Having full visibility of people and systems within the company (employees and contractors, on-premise and cloud-based services, systems and applications) is essential for understanding where the security risks are, and how to mitigate them. 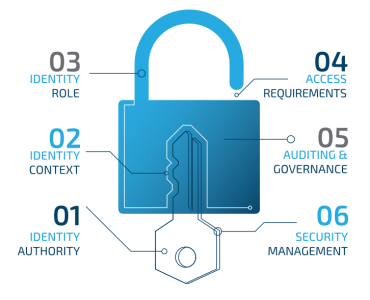 Integralis offers a wide range of identity and access management solutions to help you prevent security breaches and address governance requirements. Whether this is simple identity automation or complete IT governance, our solutions can be tailored to all requirements and levels of maturity. Achieve a 360-degree overview of all identities and access rights across hybrid systems and applications. Control users access in compliance with policies and regulations. Minimize risks by automatically identifying orphan or inactive accounts, that could be misused for attacks. Streamlined on-boarding processes save time as employees or contractors get access to the systems they need to do their job from day-one. Manage access as employees change roles in the company, and revoke access across platforms when itis no longer required. Enforce and document adherence to access policies across all applications and systems. Policies include segregation of duty (SoD) policies, role-based policies, and policies as defined in, SoX, HIPAA, CoBIT, EU GDPR, ISO27001, BaFin and other frameworks. The solution is primarily configuration driven, requiring very little customisation and will integrate seamlessly with existing entitlement platforms. The solution empowers organisations to manage identities across heterogeneous IT-systems and offers a highly configurable data model that enables organisations to make changes and scale the IT platform according to business requirements. It is possible to automate practically any business process through advanced configuration capabilities. The extendable workflow designer easily extends data control to all systems and areas of the business, and built-in best-practice processes for core identity lifecycle management, compliance control, attestation, and provisioning. Access risk management seamlessly adapts access control to business processes and reduces user management costs. The feature-rich solution is designed from a business perspective and provides business users with a simple user experience throughout. Let one of the Integralis Identity and Access Governance specialists sit with you and your team to demonstrate how security, operational efficiency, and governance are all within reach.